Now you can maintain and revive your dingy white clothes- keeping them looking like new longer with OxiClean™ White Revive™ Powder. Sparkling whites can brighten any outfit. But your favorite whites can grow dingy over time. And when that happens, what do you use? Reach for color-safe, chlorine-free OxiClean™ White Revive™ Powder. It works with your detergent, removing stains, keeping colors looking bright and washing whites back to perfection. the fresh looking whites you love. 1. Mix 1 scoop of OxiClean™ per gallon of the warmest water recommended by the garment care label. Make sure it is completely dissolved. Submerge tough stains, heavily soiled clothing, or dingy whites in solution. 2. Soak for 6 hours. 3. Wash as normal with detergent and OxiClean™ filled to line 2. Add White Revive™ to every load to remove stains & maintain brilliant whites! 1. 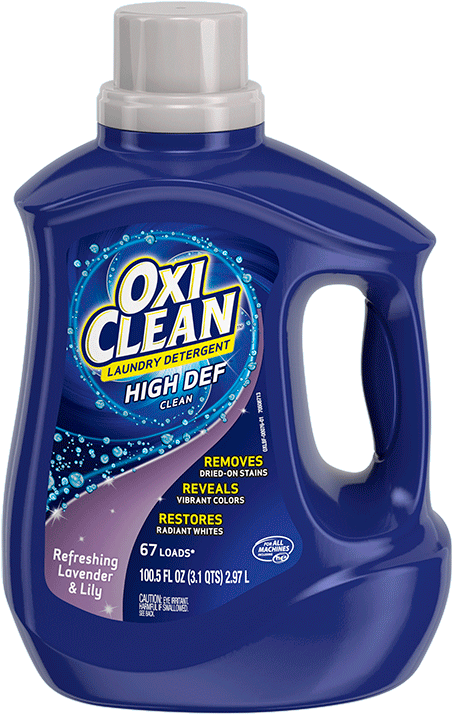 Top Loader Add OxiClean™ and detergent BEFORE adding laundry. For regular loads, fill to line 2. For large loads or extra whitening, use more. 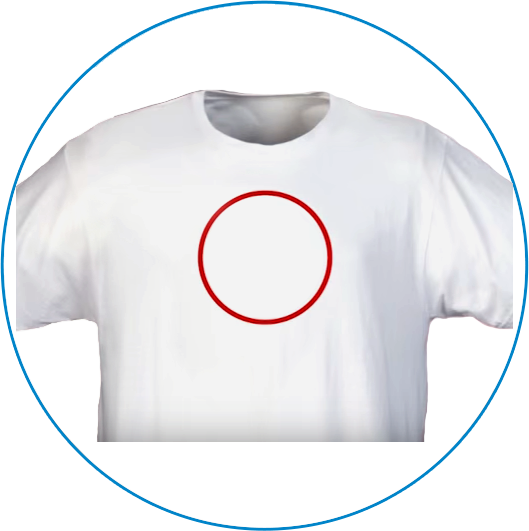 HE Washer Add detergent as you normally would and OxiClean™ directly into the drum BEFORE adding laundry. For regular loads, fill to line 2. For large loads or extra whitening, use more. 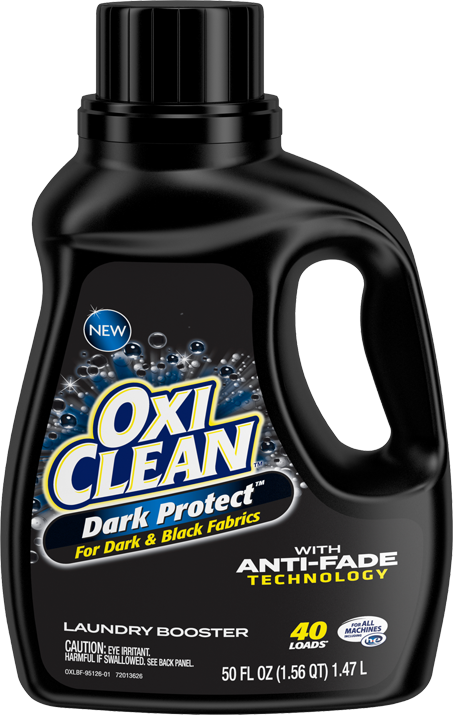 Do not mix OxiClean™ with detergent in dispenser. Read your HE owner’s manual for instructions. 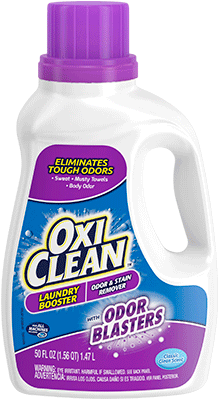 OxiClean™ White Revive™ Laundry Stain Remover powder deep cleans to remove dulling soils and stains. It also deposits brighteners to help whiten whites. 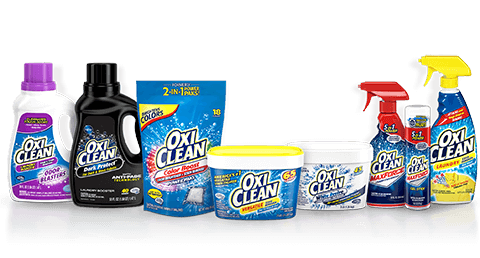 How is OxiClean™ White Revive™ Laundry Stain Remover different from OxiClean™ Versatile Stain Remover? 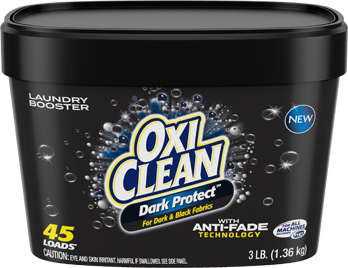 OxiClean™ White Revive™ Laundry Stain Remover powder is a laundry only product while OxiClean™ Versatile Stain Remover has many uses as well as laundry. 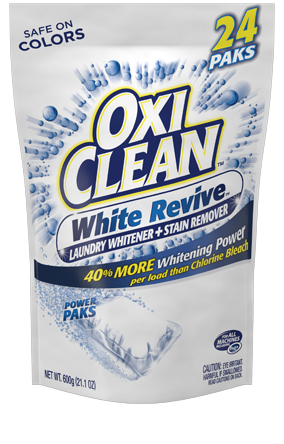 OxiClean™ White Revive™ Laundry Stain Remover formula has special ingredients to boost cleaning and whitening which can only be used on laundry. 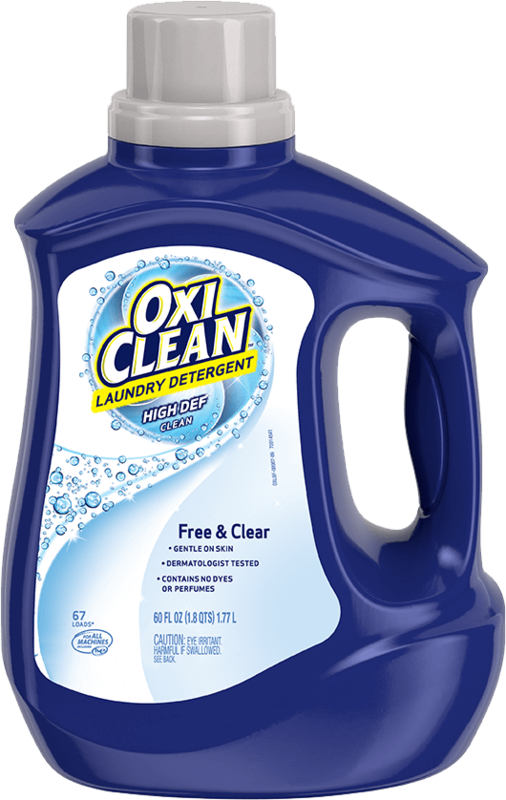 How can I best use OxiClean™ White Revive™ Laundry Stain Remover in cold water? 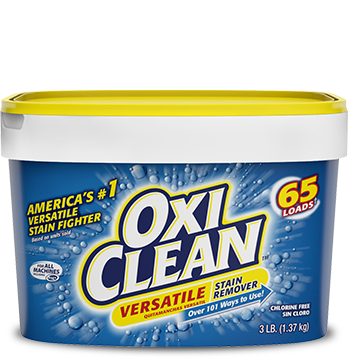 OxiClean™ powder is activated by warm or hot water. When using in cold water, first dissolve powder in hot water, and then add the warm solution to the drum or in a cooler soaking solution. Consumers who use very cold water and HE machine may find that the product doesn’t dissolve well. 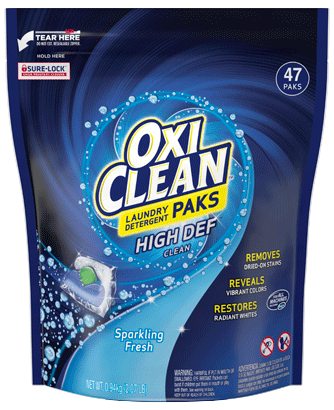 For use in cold water, we recommend using OxiClean™ White Revive™ Paks. 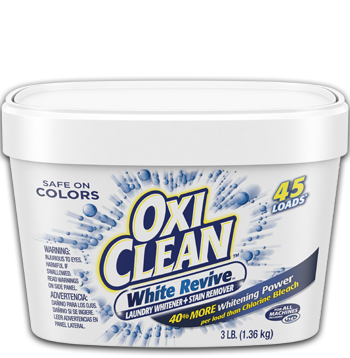 What happens if the lid to the OxiClean™ White Revive™ Laundry Stain Remover container is not tightly closed or it is exposed to humidity? 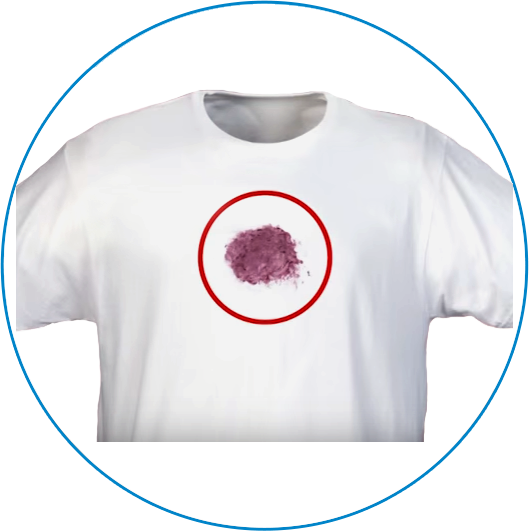 OxiClean™ White Revive™ Laundry Stain Remover may cake or could be difficult to scoop if the lid is not closed well or if the product is kept in a humid environment. 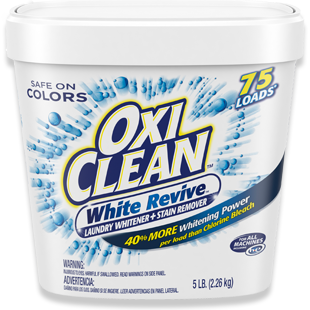 How long is the OxiClean™ White Revive™ Laundry Stain Remover solution active once mixed? 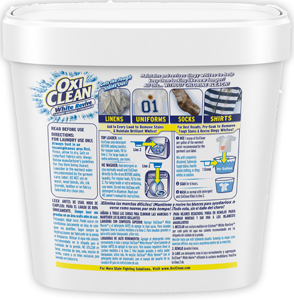 Presoak solution should be used immediately after OxiClean™ White Revive™ Laundry Stain Remover powder has dissolved completely. 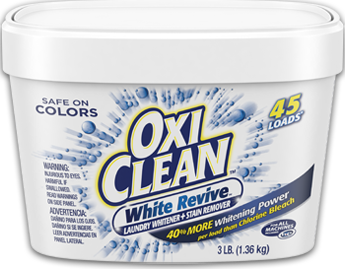 Can I store OxiClean™ White Revive™ Laundry Stain Remover in a sealed container once I have diluted it with water? 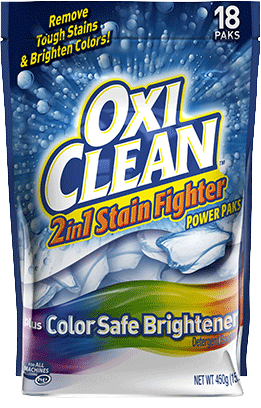 OxiClean™ White Revive™ Laundry Stain Remover is safe to use on colorfast items.